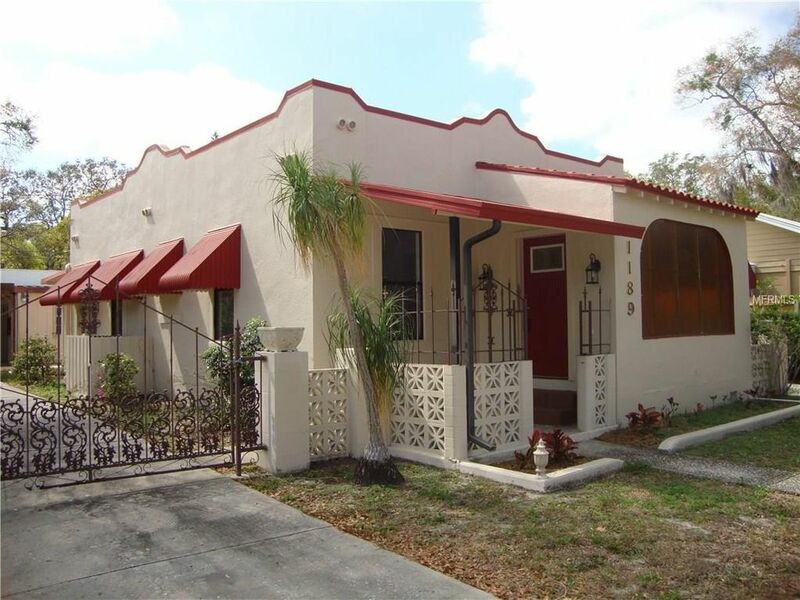 UPDATED SPANISH STYLE CLEARWATER HOME ON .33 ACRES (TWO LOTS) WITH LARGE DETACHED WORKSHOP/GARAGE THAT COULD BE A PERFECT HOME ART OR MUSIC STUDIO, OR GREAT FOR CAR ENTHUSIAST, WOOD-WORKER, ETC. NEAR CHARMING DOWNTOWN DUNEDIN & WALKING DISTANCE TO DUNEDIN STADIUM, HOME OF THE TORONTO BLUE JAYS! NEWER ROOF & NEWER CENTRAL A/C! BEAUTIFULLY UPDATED WITH REMODELED BATHS, UPDATED KITCHEN, RECESSED LIGHTING, GERMAN ENGINEERED LAMINATE-WOOD FLOORING, ALMOST ALL NEWER WINDOWS THROUGHOUT! COMFORTABLE INSIDE UTILITY ROOM. CARPORTS FOR 3 CARS, PLUS WORKSHOP/GARAGE. WOOD BURNING FIREPACE, LARGE WALK-IN CLOSET IN MASTER. SLIDING BARN DOOR TO MASTER ADDS RUSTIC & ARTISTIC TOUCH TO THIS AMAZING HOME WITH HIGH 9 FT. CEILINGS THROUGHOUT! NEWER INSTANT /TANKLESS HOT WATER SYSTEM. PLENTY OF ROOM FOR RV/BOAT PARKING! MAIN HOME = 2 BEDROOMS w/ 1, 168HtdSF, plus Wall Unit A/C'd bonus room (304sf) = 1, 472 total htdsf. SEE PHOTOS & VIRTUAL TOUR! PRICED WELL BELOW RECENT APPRAISAL. BE SURE TO SEE THE BONUS ROOM /3RD BEDROOM (PLUMBED FOR 3RD FULL BATH) TO RIGHT OF SHOP ENTRY WHEN COMING FROM MAIN HOME. SOLD AS IS, WITH RIGHT TO INSPECT . Directions: DOUGLAS AVENUE, WEST ON IVA STREET. CORNER OF DOUGLAS & IVA.